If you were to close your eyes and envision the ideal Colorado hiking trail, it would probably look like a path on Colorado’s Western Slope, with skyscraping peaks, wildflower-strewn meadows, and cliff-lined desert canyons as far as the eye can see. The Centennial State’s Western Slope (which is everything west of the Continental Divide) is home to tons of amazing hiking destinations—like the Black Canyon of the Gunnison, Gunnison Gorge, West Elk Mountains, Grand Mesa, and Escalante and Big Dominguez Canyons—where you can explore paths blazed by Native Americans, Spanish explorers, and mountain men. You’ll find overlooks with spacious 360-degree views and be able to venture deep into remote wild areas to find solitude. There are hundreds of miles of trails to choose from. It’s great to have options, but we know it can also be a bit overwhelming, so we put together a list of 10 of the most unforgettable hikes to get you started. The Crag Crest National Recreation Trail makes a 10.3-mile loop across the roof of Grand Mesa, the biggest flattop mountain in the world. The trek includes a 6.5-mile section that traverses the narrow crest of a ridge and the 3.4-mile loop portion of the route. This excellent hike, easily shortened with a car shuttle, passes glassy lakes and meadows filled with summer wildflowers before climbing onto 11,189-foot Crag Crest, a narrow rocky ridge. From this high perch, you’ll enjoy stunning views across Delta County to the San Juan and West Elk Mountains and the wooded Grand Mesa, a land of 300 lakes. Stop by the Grand Mesa Visitor Center for information and maps before setting out, and don’t forget a rain jacket. It’s easy to see why Grand Mesa is a popular hiking destination in summer. Its 10,500-foot elevation makes it a refreshing getaway from lowland heat, and the Mesa offers miles of easily accessed trails that edge past sparkling mountain lakes. The Ward Lake Trail, an easy 1.25-mile path, is a great introduction to the area. Beginning at Ward Lake Campground just east of Grand Mesa Visitor Center, the kid-friendly trail loops around the lake, passing prime fishing holes, tall spruce trees, and plenty of wildflowers, including columbines (the state flower), Indian paintbrush, larkspur, marsh marigolds, and owl’s claw. You can find ancient petroglyphs on the Big Dominguez Canyon Trail. 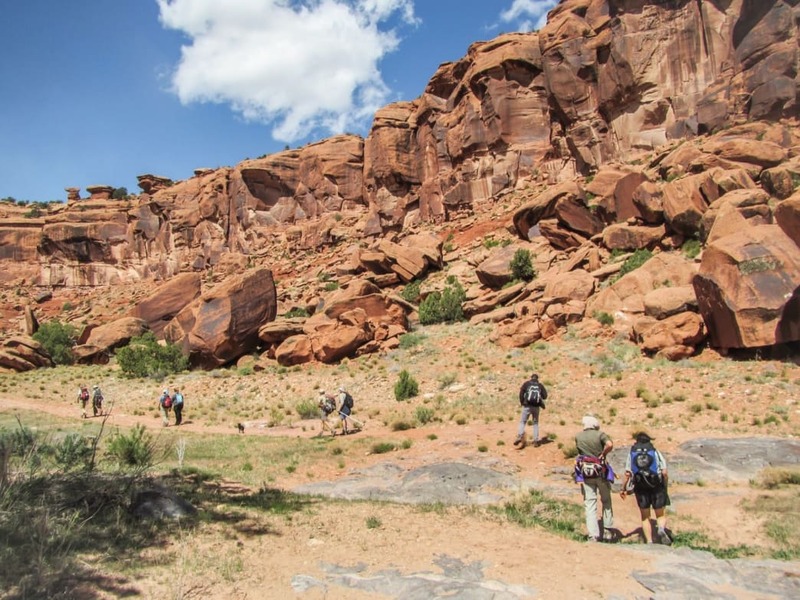 The Big Dominguez Canyon Trail explores the heart of 210,172-acre Dominguez-Escalante National Recreation Area, a wild land of cliff-lined canyons, Native American rock art sites, several waterfalls, and gorgeous scenery. The entire Big Dominguez Canyon Trail stretches for seven miles one-way, so you can tailor an out-and-back trip to suit your ability level. For an excellent 8-mile trek, start at the Bridgeport Trailhead on the Gunnison River and go four miles up the rugged canyon to reach a 45-foot-high waterfall and a large boulder covered with ancient petroglyphs. From this point, retrace your steps to the trailhead. The Black Canyon of the Gunnison, protected as a national park, is one of Delta County’s startling landscapes, with soaring canyon walls falling away to the thunder of the roaring Gunnison River far below. The park road on the North Rim offers dramatic overlooks, but you can get an up-close view of North America’s narrowest gorge by hiking less than a half-mile on the Chasm View Nature Trail. The short loop hike, beginning at the North Rim Campground, edges along a precipitous cliff edge to several fenced viewpoints. You look across the deep canyon to Chasm View Overlook on the South Rim a scant 1,100 feet away, while the Gunnison River gushes 1,800 feet beneath you. 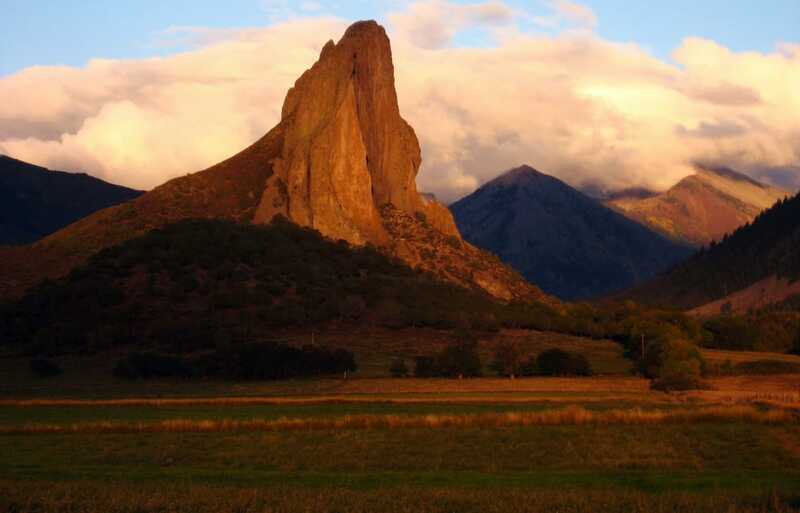 Reaching an elevation of 7,874 feet, Needle Rock is the solidified plug of an ancient volcano. Part of a preserved natural area covering more than 62,000 acres, the Gunnison Gorge is a deep, 14-mile-long canyon carved by the Gunnison River. It’s not only home to trophy-sized trout, but also fantastic hiking and biking trails. The Ute Trail, used by Native Americans for thousands of years, begins on a ridge above the gorge. It steeply descends 4.5 miles to the fast-flowing river and runs beside tall cliffs, quiet picnic spots, and fishing holes. To reach the Ute Trailhead, you have to travel the rough Ute Road with requires a high-clearance four-wheel-drive vehicle. A tilted sandstone flatiron creased by three canyons rises above the Gunnison River at the northern end of Gunnison Gorge. Cool Rock Canyon, the middle one, offers a family-friendly, out-and-back hike up a dry creek bed with plenty of scrambling over water-smoothed boulders pocked with potholes. Drive out South River Road along the river’s south bank to a small parking lot and the marked trailhead. Hike up the colorful canyon for 2-3 miles, and then return to the trailhead. Mount Lamborn, the 11,396-foot high point of Delta County, dominates the view from Hotchkiss and Paonia. The county’s signature hike climbs 5,500 feet in seven miles on the Lamborn Trail and Mount Lamborn Trail from McCluskey State Wildlife Area. The full-day adventure follows Bell Creek up a densely wooded valley and then cuts onto a ridge covered with aspen, fir, and spruce. Finish by scrambling up rocky slopes to the airy summit and forever views of the West Elks, Grand Mesa, and the snow-capped San Juan Mountains. Bring plenty of water, a raincoat, and a good map. Needle Rock, the solidified plug of an ancient volcano, is an iconic landmark in eastern Delta County. The 7,874-foot formation, looming 800 feet above the Smith Fork River, boasts a stately shape that ends in a pointed summit. While only experienced rock climbers reach the top, a fun hike follows the Needle Rock Trail from a trailhead on Needle Rock Road. The trail ascends through a piñon pine and juniper woodland for a quarter mile to the north side of the rock and offers gorgeous views across the river valley to the rugged West Elk Mountains. 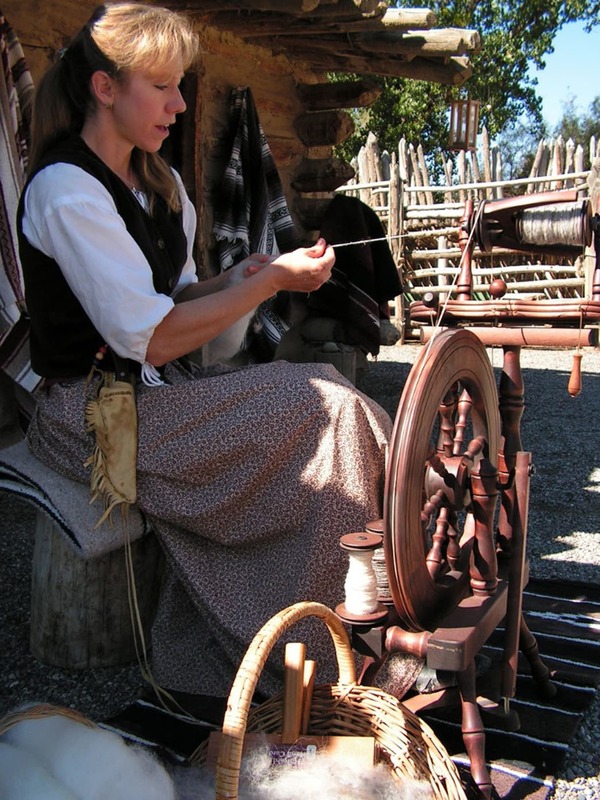 Spinning demonstration at Fort Uncompahgre. Confluence Park is a hiker-friendly spot with five miles of trails that thread through tall cottonwoods at the confluence of the Gunnison and Uncompahgre rivers. The north section of the 265-acre city park is a quiet natural area with nesting great blue herons, bald eagles perched in trees, and mule deer rustling through tall grass. A swinging bridge crosses the Uncompahgre and leads to a short trail that tramps north to the confluence. There’s also a 2.2-mile trail that loops around 65-acre Confluence Lake, a haven for anglers casting for trout, catfish, and bluegill. After hiking, trek over to Fort Uncompahgre Living History Museum at the park’s northeast corner and see the early history of Colorado’s Delta County come alive. The museum is a replica of a trading post built by trapper Antoine Robidoux in the 1820s. Written by Stewart Green for Matcha in partnership with Delta County Colorado.